If you are brainstorming ideas for corporate awards in San Jose or Santa Clara, why not take a creative approach? After all, the employees and coworkers being honored are likely some of the brightest and most innovative contributors to their field. A personalized and creative approach to the time-honored tradition of conferring corporate awards will energize your team, while simultaneously rewarding hard work. The physical form of the awards that you present should reflect the tone, aesthetic, and personality of your company. If your firm is innovative and fun, ask your awards shop for recommendations on a contemporary award that will embody these characteristics. Elegant bronze, acrylic, or glass awards are excellent for communicating a sense of gravity and accomplishment. Be sure that your corporate awards are engraved with important dates, words, or phrases to make them personal. 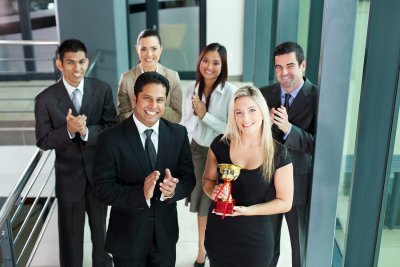 Show your team that you appreciate and recognize individual strengths by creating personalized awards categories that showcase individuals’ unique assets. For instance, if your company has one team member who you can always count on to be the voice of calm on a hectic day, why not show him or her that you appreciate this trait by designing a personalized award that recognizes this important ability. Get everyone involved by asking team members to help devise categories that truly represent your company. Plan a memorable and entertaining event during which to distribute your corporate awards. Engage all members of your team, not just those who are being honored, by recognizing all guests with a special toast or thoughtful speech. Consider distributing small keepsakes to each place setting before the event so that employees are greeted with a special token of their contribution to the team. Remember that your corporate awards ceremony can motivate and inspire your whole company, while at the same time honoring those who have demonstrated outstanding achievement throughout the year.